(Reading, PA) - The Reading Fightin Phils, Double-A affiliate of the Philadelphia Phillies, have released its 2019 schedule in conjunction with the Eastern League and its teams. 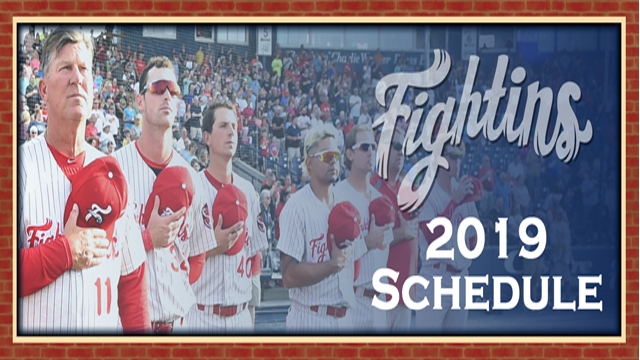 The Fightin Phils will open up their home slate in 2019 with a six game homestand against the Richmond Flying Squirrels and Portland Sea Dogs from April 12-17th. They will begin the 2019 season on the road, starting on Thursday, April 4th in Portland. The 2019 promotional schedule will be announced at a later date. At all home games beginning with Friday, August 10th, fans will be able to reserve their group outings or renew their season tickets and mini-plans. As an added bonus, anyone who renews or purchases a new 2019 season ticket or mini-plan during one of the remaining Fightin Phils home games will receive their choice of a FREE Adam Haseley autographed baseball, a Rhys Hoskins Hat, a Sandlot Long-billed Hat or a Fightin Phils Team Store voucher. For every ticket plan purchased, fans get a choice of one item. Quantities are limited and this offer is valid while supplies last during Fightin Phils home games! America's Classic Ballpark is proud to be a part of Pennsylvania's Americana Region. Individual and group tickets for the 2018 season are available online at Fightins.com, by phone at 610-370-BALL, and in-person at FirstEnergy Stadium. Follow the Fightin Phils on Twitter at @ReadingFightins and like them on Facebook via www.facebook.com/fightins.